The 2018 Toyota Rush is available in Colombia with only a 1.5-litre Dual VVT-i petrol engine married to a 4-speed automatic transmission. The second generation Toyota Rush is made in 5- and 7-seat versions, but Colombia has received only the latter. The crossover-styled MPV is 4,435 mm long, 1,695 mm wide and 1,705 mm high. It has a 2,685 mm wheelbase and a 220 mm ground clearance. It rides on a traditional ladder-frame chassis. The 2018 Toyota Rush is available with only a 1.5-litre Dual VVT-i petrol engine that produces 103 hp at 6,000 rpm and 136 Nm of torque at 4,200 rpm. This naturally aspirated mill sends power to the rear wheels via a standard 4-speed automatic transmission. On the outside, the all-new Toyota Rush features smoked LED headlights, 17-inch wheels, LED rear lights and shark fin antenna. Inside, the MPV has a two-tone colour scheme and comes equipped with an automatic climate control system, 7-inch touchscreen multimedia system from Pioneer, six speakers, chrome door handles and leather-wrapped gear knob with chrome detail. On the safety front, Toyota offers six airbags, ABS with EBD, ISOFIX child-seat anchors, rear parking sensors and a rear parking camera. The Toyota Rush is available in Colombia in a single ’S’ grade and costs 89,900,000 pesos (INR 21,41,225.03). New reports say that it will go on sale in Pakistan next, in September this year. There, it’s expected to start from PKR 3.8 million (INR 21,66,064.96), which is roughly the same as in Colombia. Toyota Colombia sells the Rush in only a feature-packed S grade. It is imported from the Indonesian factory. 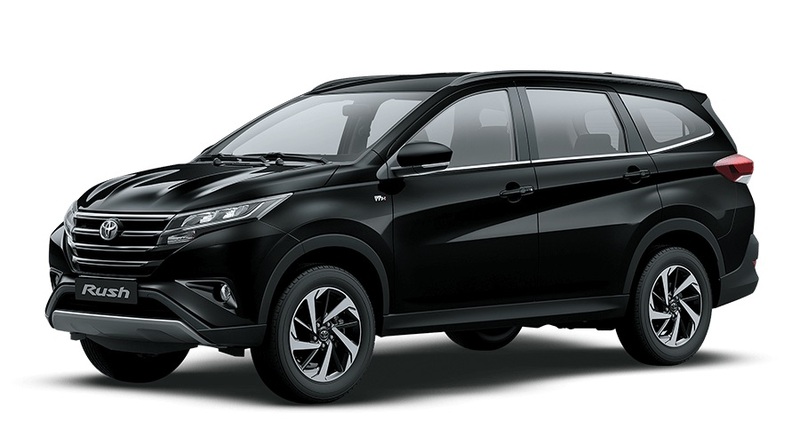 There’s no word on the Toyota Rush’s Indian launch yet. Even if TKM decides to launch it, we don’t expect that to happen in the near-future. The company will launch its first Toyota-badged Maruti Suzuki model, in Q2 2019.